This sensational fashion is perfect for traditional flamenco dancing, bolero ballroom dancing, or contemporary salsa. The princess-seam dress has flounced cap sleeves, V-neck front, scoop-neck back, and four lavish flounces attached to foundation tiers. The skirt has a raised and slightly shaped waistline and three flounces (although you can make it with only one or all four). 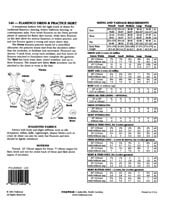 The simple-sew fabric Rose accessory can be pinned to the dress or worn in the hair. 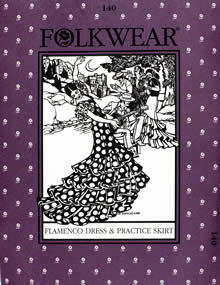 Pattern includes Flamenco history and terminology. Misses extra Small to Extra Large.